Fibers, wovens and intelligent textiles, for some time now colleges, research institutes and even individual architectural offices have discovered the joys of textile research for the construction sector, and are attempting to sound out the very limits of fabrics. The research findings as regards the new compound materials range from mobile textile walls to digital fabrication. 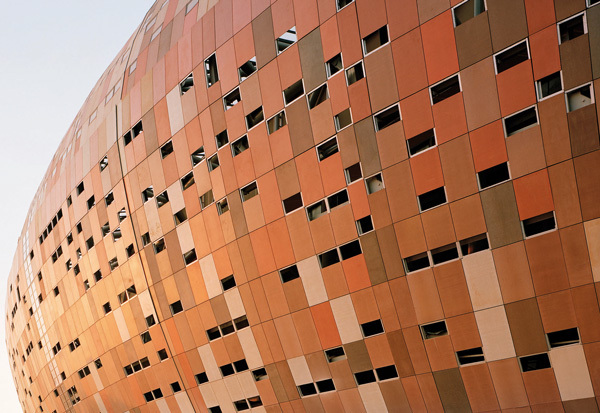 Precisely thanks to digital applications and robotic production methods, completely new structures have become possible, and extraordinary buildings made using intelligent materials. Time to tour the world of research on textile construction activity. How do you put light in concrete? 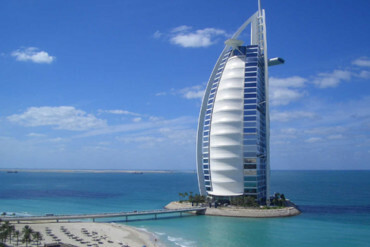 Since the early 1990s much research has gone into textile-reinforced concrete. 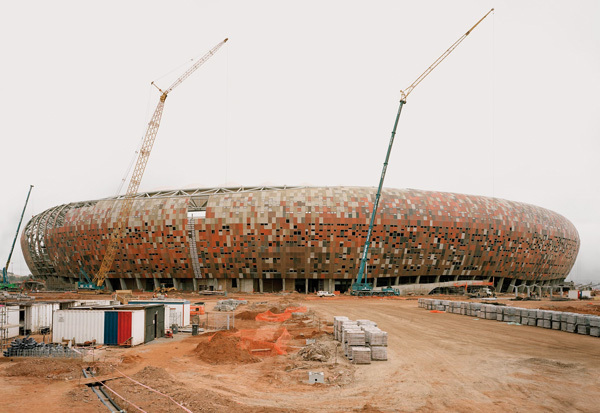 Carbon and glass fibers replace the customary reinforcing steel and enable extremely thin and light concrete sections that exhibit a great tensile strength. Today, textile-reinforced concrete can do a lot more besides: Using so-called fiber composites you can create performative and transformative architectures, such as the Institut für Textiltechnik new build at RWTH Aachen, commissioned in 2012. Thanks to Lucem Lichtbeton the building is quite literally a shining example of the new opportunities for designing structures with textile concrete. The frontage is clad in 136 thin light concrete panels, each with thousands of embedded wafer-thin light-conducting optical fibers. 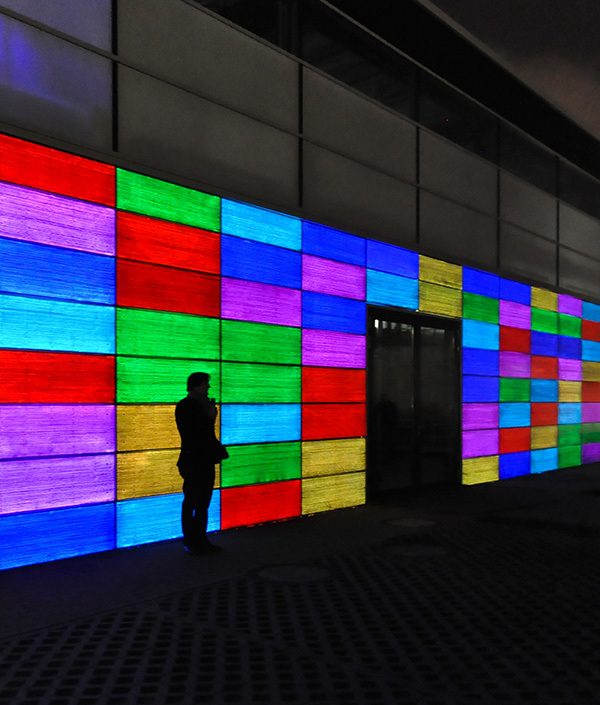 An LED panel with three RGB chips each is mounted behind every element in the façade, covering a spectrum of 16 million colors. 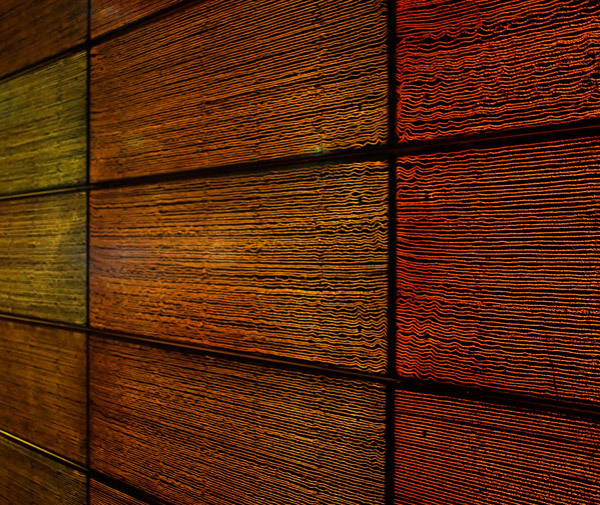 Come darkness, what are by day anthracite colored dense light-concrete panels turn into bright, translucent surfaces. Software allows still, moving or interactive light images to be staged on the frontage, and in this way the light concrete affords new forms of media façades. The future of textile-reinforced concrete is above all related to how it fosters energy-efficient and sustainable structures. It weighs less than conventional concrete and thus saves resources. Moreover, work at present is focusing on consistently advancing fiber composites using two or more materials in the concrete. As an intelligent material, concrete may in future not only conduct light through the textile reinforcers, but also use textile sensors to identify heat, water damage or deformation of sections of the building. 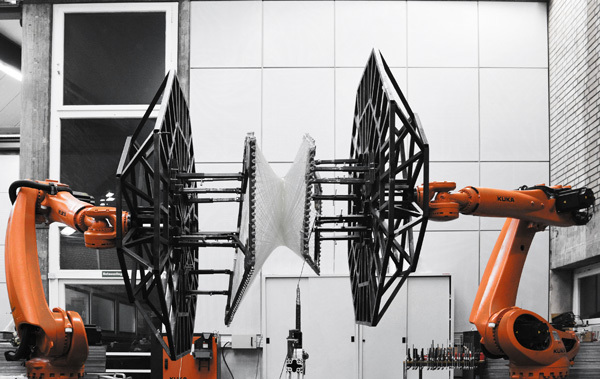 How robots can manufacture buildings from fiber composites is something being investigated by Stuttgart University’s Institut für Computerbasiertes Entwerfen (ICD) and Institut für Tragkonstruktionen und Konstruktives Entwerfen (ITKE). 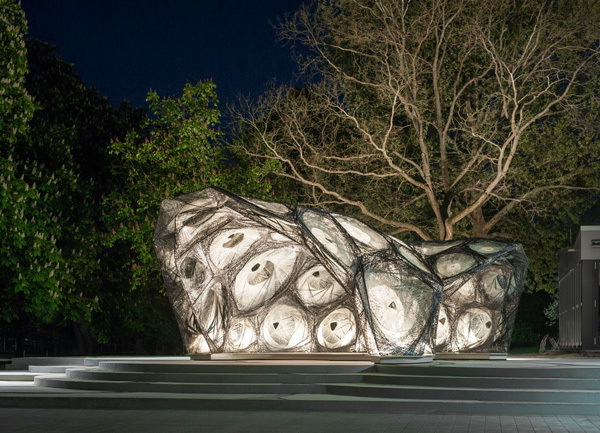 As part of the ongoing series of temporary trial buildings, in March 2014 the researchers and students headed by Achim Menges erected a pavilion made of fibers woven by robots. The geometrical shape of the load-bearing structure is based on the dual shell of the wing cases of beetles that can fly and is made up of 36 sections, each with its own shape and fiber pattern. Two interacting robots were programmed to make them, spinning the glass and carbon fibers, steeped in resin, in a coreless winding process. The method really spares resources and materials, and shows what new fiber composite building methods are possible thanks to computer-based modeling and synthesis of biological structural principles in combination with robotic manufacturing systems. Another field where there is much experimentation on the use of textiles in architecture is that of movement and interaction: In line with the idea of an all-round space, the wall as an architectural element is being extracted from its original immobile function. Thanks to innovative textile properties, moving, dynamic walls can be created as a flexible skin that responds to the user. For example, Mette Ramsgard Thomsen at the Centre for Information Technology and Architecture (CITA) attached to the Royal Danish Academy of Fine Arts has run research projects such as “Slow Furl” (2008). In her installations, robotic membranes respond by sensor to stimuli, translate these into movements, and develop their own behavior. The result is an architecture of folds, niches and interstices. The “Kinetic Wall” created by Berlin architects Barkow Leibinger was an impressive item at the Venice Architecture Biennale 2014. A membrane was pulled taut over a secondary structure boasting individual pneumatic valves which were attached at their heads to the membrane. Digital controls extend or retract the valves individually to form hollows, protrusions or niches. Through the tension and expansion of the material, the two superimposed membrane layers create a special Moiré effect: The changing spatial shapes that arise from projections onto the membrane mean that the layers of material have differentiated ephemeral and translucent properties. 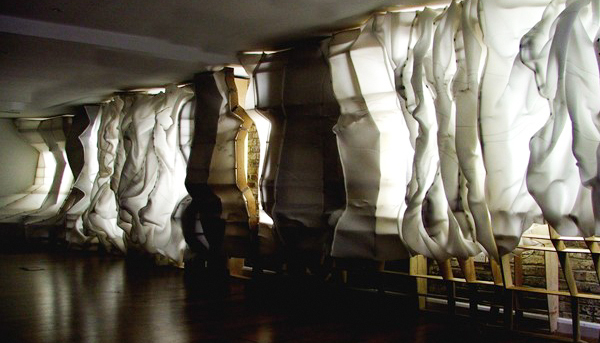 This soft textile installation points up the potential for a new form of organic building, with walls acting here as spatial structures. In recent years, bionics or nature as the source of ideas for developing new shapes and textile materials has increasingly come to the attention of the construction sector. For example, since 2013 a research group has been exploring the phenomenon of polar-bear fur as the basis for a new type of membrane construction that is highly energy efficient and acts as a loss-free heat accumulator. The way the polar bear’s white fur and black skin function was adapted here for architecture: in the “polar bear house”, a trial pavilion. Special textile solar-thermal collectors were developed that are purpose-suited for tough roof surfaces that are precisely not smooth – on membrane buildings. As with the light polar bear fur, the outer layer (made of ethylene-tetrafluoroethylene foil (ETFE) boasts solar collectors and a flexible heat absorber and allows sun light to shine through it. The bottom-most layer consists of a black, highly porous absorber foil that enables air to circulate between the layers and can heat to as much as 160°C, as does the bear’s blood circulation system. The energy garnered from the circulation of the heated air (140°C for 1,000 W per sq.m) is not wasted, as a new efficient heat accumulator was developed than converts the solar energy into chemical energy and stores it almost without any heat loss. The principle behind the polar bear’s fur could therefore lead in the future to energy-saving foil roofing structures enabling houses to require no external energy sources. Membrane constructions give a new sense of lightness to architecture. Fibre-based construction materials replace classic materials like steel. 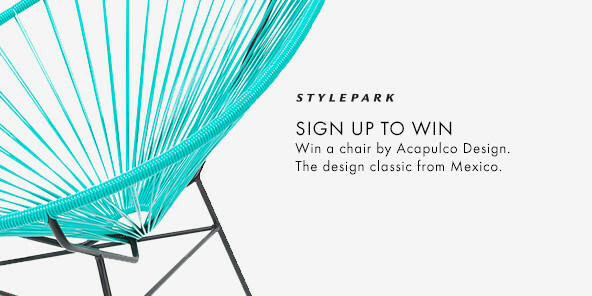 Architecture has rediscovered the possibilities of textiles. Smart textiles and luminescent fabrics at the Techtextil 2015 in Frankfurt am Main. 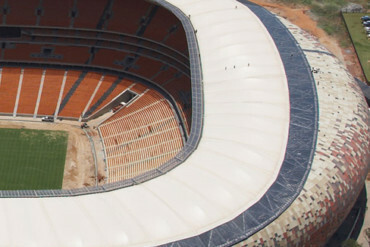 The stadon "Soccer City" in Johannesburg in South Afrika. 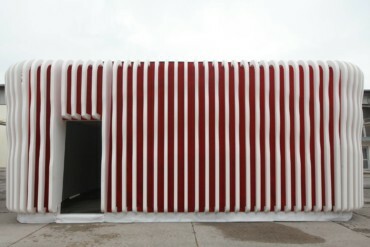 Detail of the façade as an example for a new interpretation of a media façade due to light concrete. 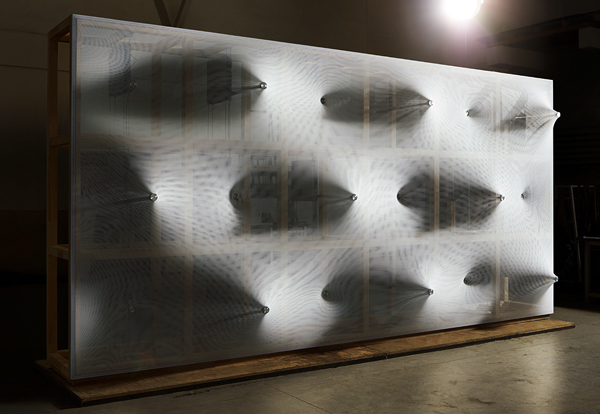 Kinetic wall: installation at the Architecture Biennale 2014 in Venice by Barkow Leibinger from Berlin.